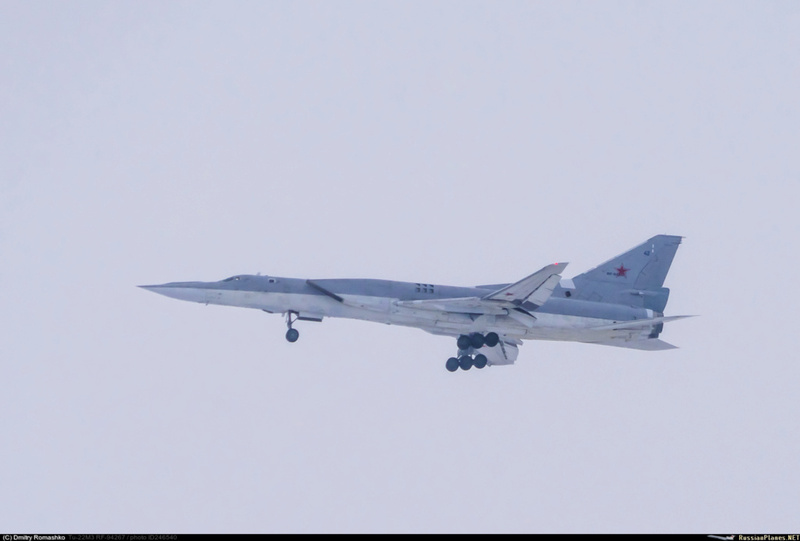 Nice shot of the Russian Naval Aviation Ty-134UB-L (white # 54, registration # RF-12037) training aircraft for Tu-22M3 and Tu-160 pilots. 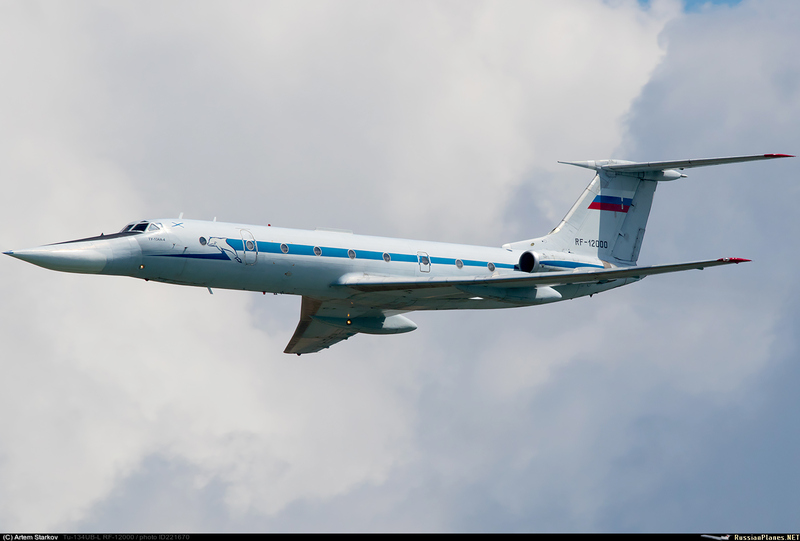 This aircraft was overhauled last year at the Minsk Plant of Civil Aviation No. 407. According to Eehnie this is clearly a Tu-22. 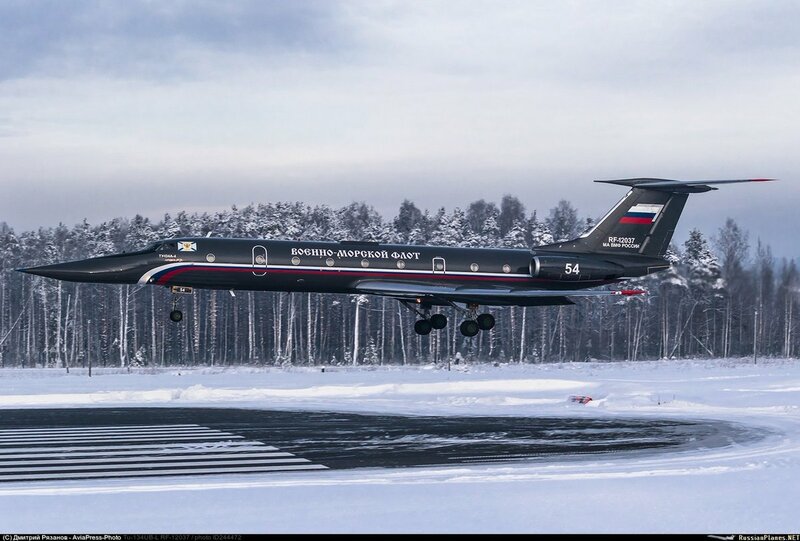 There is no such thing as tu-134 just look at the nose !! Navy does not need UBL since have not strategic bombers in their ranks. 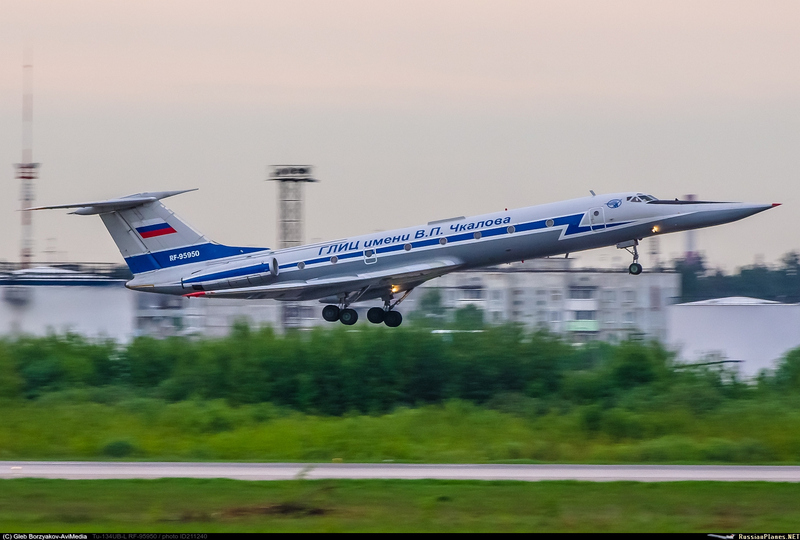 But like the Tu-22M and the Tu-22 the engines are different and mounted differently, the wings are different and fixed, the entire shape of the aircraft is different... the only extra difference between this aircraft and those is that this one is not called Tu-22. There is a light twin engined bomber from the early post war period that is called Tu-22 and it looks nothing like the Tu-22 we know let alone like the Tu-22M we also know. 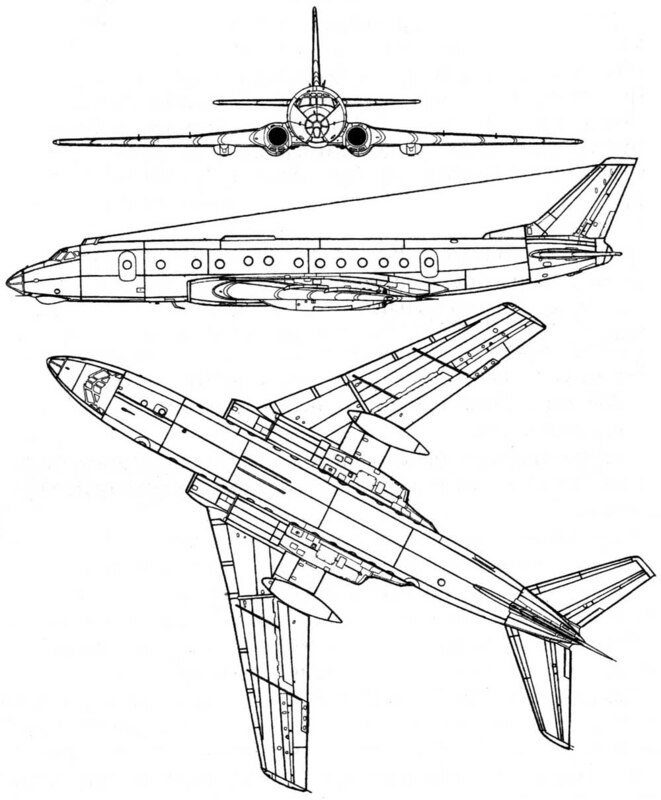 The Tu-22M designation was not reused because this aircraft was related to the Tu-22, it was used specifically because it wasn't... because there was no funding for a brand new design, but there was always money for upgrades. Btw their noses r also similar. No1 said that here! "Directly related" isn't the "same"! 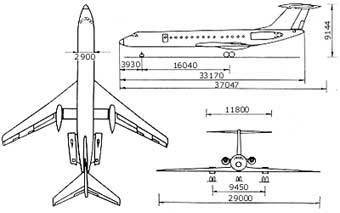 Their wings & tails have different shapes, engines r mounted differently, but the fuselages & noses r identical. The latter is larger, has swept wings, different engines, 7 better performance. actually PAK-DA aka Messenger has the same form as B-2. US needs B-1/B to do what? Attack Russian CSGs? AMCXXL wrote: Navy does not need UBL since have not strategic bombers in their ranks. Not really. 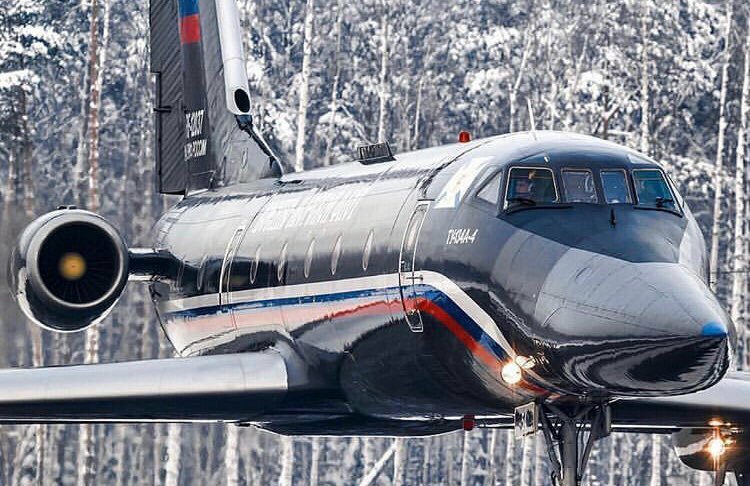 Tu-134UBL is still being used to train Tu-22/Tu160 pilots. Including naval aviation. It was shortly written off but in 2013-2014 returned to service. 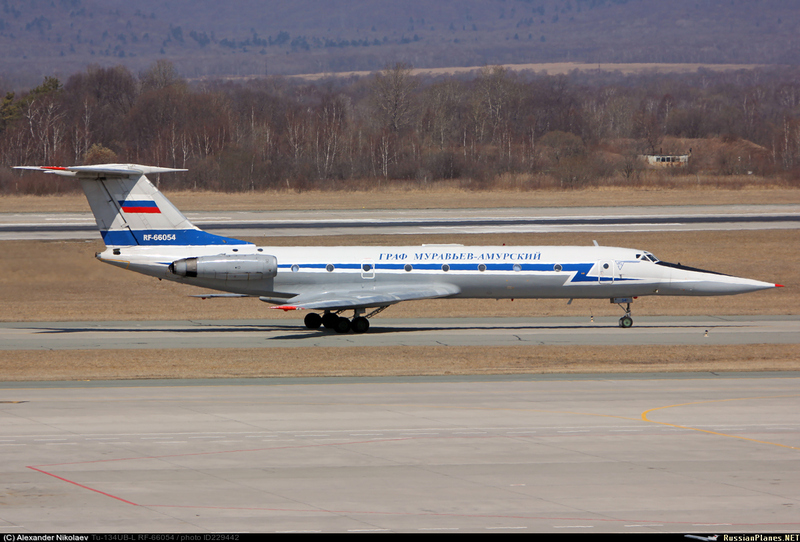 Tu-134UBL is still being used to train Tu-22/Tu160 pilots. Including naval aviation. 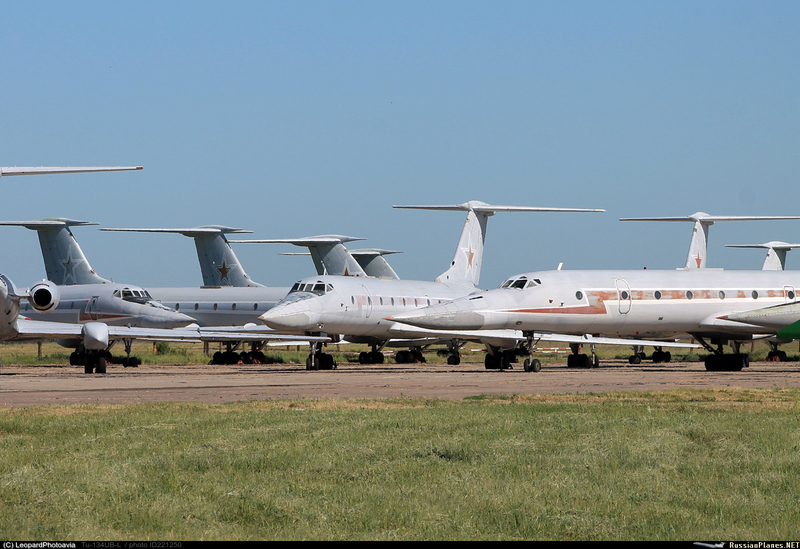 All Tu-22Ms were transferred to the AF after 1991 & now r in the VKS. 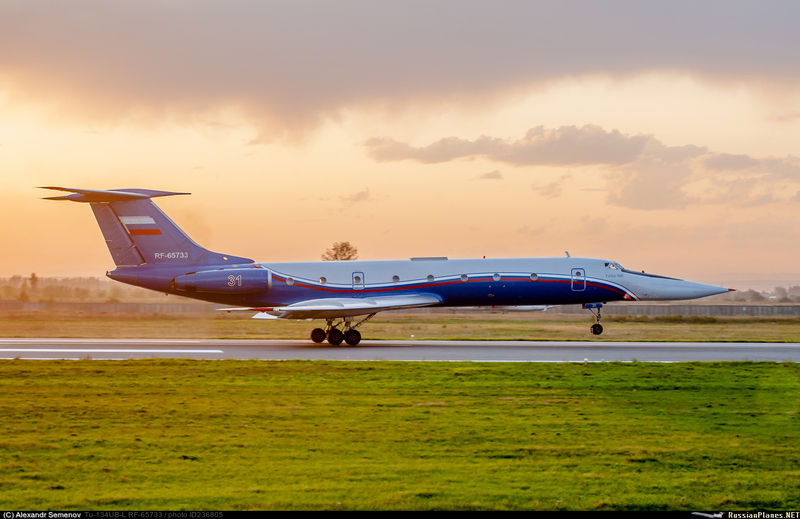 Even if its a Tu-134A4 the Navy still needs it so they get first dibs, as their VIP transport. Anyway, that's a brilliant colour scheme. Last planes were transfered in 2011. Yet still Tu22 are flying, their tsk is CSG deterrence so somewhere pilots need to be trained on? Their noses are not that similar. Directly related means like a father son relationship direct lineage... not came from the same country and had the same last name. actually PAK-DA aka Messenger has the same form as B-2. The B-2 was intended as a bomber that would penetrate enemy airspace right to the target and release munitions over the target... it has evolved because they have started to realise that is not going to happen and low altitude penetration bombing was the new plan. The Russian aircraft is a cruise missile carrier that might be a bomb truck on short range non nuclear missions... they are not the same. US needs B-1/B to do what? Attack Russian CSGs? Their small differences doesn't change that they r closely related. I saw them up close. 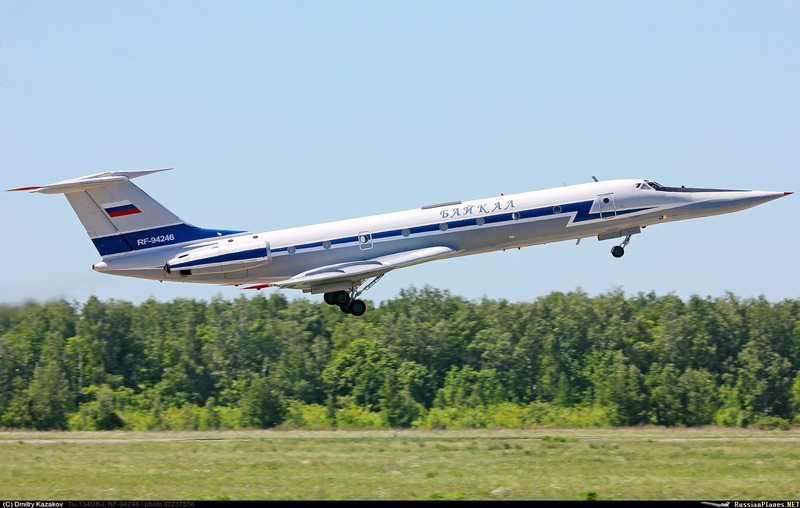 They do have a history of reusing or having related designations for related designs.... an obvious example is that the upgrade of the Il-76 is called the Il-476 and there is a reduced size model with two engines to be called Il-276... clearly the 4 means four engined upgraded Il-76 (Il-76M has already been used), while the Il-276 means twin engine model of the Il-76. This is especially with airliners, which often were directly based on each other or related in some way. 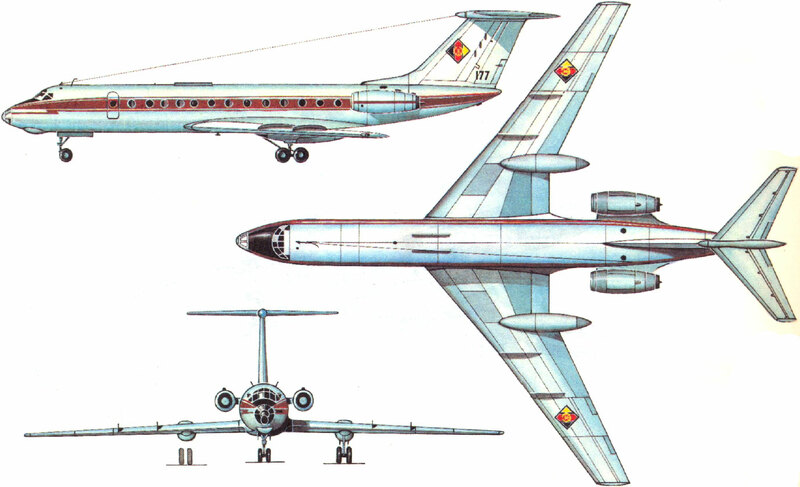 The Tu-22 and Tu-22M are NOT and don't look the same. There is a lot of difference between B-2 and both PAK-DA and new B-21, first one is an huge intercontinental plane with four engines, other are smaller and have just two i.e. are about the size of a Tu-22M3 but with greater range. B-1A was though to fly at high quote reaching 2+ mach, B-1b traded high speed with low quote capability and semi-stealth. And it was not cancelled at all: 100 were ordered as an interim solution between B-52 with ALCM and ATF (i.e. B-2 Spirit) and 100 were produced. Olenya regiments were disbanded, the last in 2011. All your wrote above is true but it was not my point. My point was US builds planes it needs o fulfill doctrine. US dont need Tu-22 type bombers to attack CSGs, because they so far are the only ones using them. BTW B-2 and PAK DA do have same form - flying wing. We dont know what the range of PAK DA is going to be but since it is strtegic bomber its range is unlikely to be below intercontinental. US dont need Tu-22 type bombers to attack CSGs, because they so far are the only ones using them. They'll need them now, in case of confrontation with the PLAN. USAF B-52s armed with harpoons/naval mines & B-1Bs (the direct Tu-22M counterpart) have a 2ndary maritime strike mission. Thirty B-52Gs were further modified to carry up to 12 AGM-84 Harpoon anti-ship missiles each,..
New US Navy's maritime strategy in early 1980s called for aggressive use of carriers and surface action groups against the Soviet navy. To help protect the carrier battle groups, some B-52G were modified to fire Harpoon anti-ship missiles. These bombers were based at Guam and Maine from later 1970s in order to support both the Atlantic and Pacific fleets. In case of war B-52s would coordinate with tanker support and surveillance by AWACS and Navy AWACS planes. B-52Gs could strike Soviet navy targets on the flanks of the US carrier battle groups, leaving them free to concentrate on offensive strikes against Soviet surface combatants. Mines laid down by B-52s could establish mine fields in significant enemy choke points (mainly Kurile islands and GIUK). These minefields would force the Soviet fleet to disperse, making individual ships more vulnerable to Harpoon attacks. The LRASM was not originally planned to be deployed on the B-1, being intended solely as a technology demonstrator, but in February 2014 the Pentagon authorized the LRASM to be integrated onto air platforms, including the Air Force B-1, as an operational weapon to address the needs of the Navy and Air Force to have a modern anti-ship missile. In August 2015, the Navy officially designated the air-launched LRASM as "AGM-158C". The LRASM achieved Early Operational Capability on the B-1B in December 2018. The VMF & other navies that get on the US bad side may also face them in the future. But they so far they are not much of use. OK when Chinese CSGs will roam close to US shores the question returns. But Harpoons and B-52 can work only against Iranian navy. With LRSMs situation can be different but I wonder how slow LRSMs will work against CSG full equipped with AWACS and potent air wing/AAM. I'd rather suspect that US would deploy PGS in counter CSG role. the form .i.e. flying wing is the same. Tasks different but they are build to different doctrines. IMHO B-21 and PAK-DA will be much closer in mission profile. I was talking about the Tu-22 and Tu-22M. Amusing... but I really don't know how you can be so sure about what the design of the PAK DA is when we have not seen it yet. The purpose of the PAK DA is to replace both the Backfire and the Bear in theatre and long range strategic missile strike roles... this requires enormous internal space and does not really require much in the way of flight speed so you might find the PAK DA is a rather fat wing aircraft that is not a twin of the B-2 so it can carry large ordinance internally like the Father of all bombs and various cruise missiles and other weapons. In comparison the Tu-160 was never intended to penetrate enemy airspace with speed... it merely carried cruise missiles intended to do the low flying penetration which is fine... they only made a couple of dozen because they ran out of time and money... if the cold war had not ended they would probably have 150 by now and the Bear would probably have been retired. The B-1B is the black sheep, not the Tu-22M3M... it is a very potent and capable modern aircraft that will become even more capable as new weapons like GZUR and Kinzhal enter service. B-2 has payload 2x18 tons? PAK DA was supposed to have 30t? Im not sure what do you mean they re so different in form or performance? GB wrote: In comparison the Tu-160 was never intended to penetrate enemy airspace with speed... it merely carried cruise missiles intended to do the low flying penetration which is fine... they only made a couple of dozen because they ran out of time and money... if the cold war had not ended they would probably have 150 by now and the Bear would probably have been retired. Tu-95? not really I see Tu-160s in ASW / Maritime patrol role. Well, I would rather like to know more about the PAK DA before giving a definitive comment, but the B-2 is a subsonic flying wing bomber that was intended to carry nuclear bombs on strategic missions. It has had that mission expanded to include a conventional role in the various imperial colonial conflicts the US has gotten itself involved with, and the performance of the Russian air defence forces has changed its mission from an easy medium altitude stealth penetration so low level penetration and stand off weapons. The PAK DA on the other hand, while it is also a flying wing design that is most likely subsonic, has the primary role of cruise missile carrier in the strategic role and bomber in the theatre role.... which demands rather huge internal volume... for bulky weapons options over shorter ranges of the theatre bomber role, and a lot of extra fuel and cruise missiles for the strategic role. I think it will have a thicker profile than the US aircraft to allow more internal volume for bigger weapons to be carried internally... along with extra fuel for strategic missions (with smaller cruise missile payloads). The payload of the B-2 appears to be almost as good as the Tu-22M3...obviously over rather greater ranges though. BTW B-2 and PAK DA do have same form - flying wing. We dont know what the range of PAK DA is going to be but since it is strategic bomber its range is unlikely to be below intercontinental. Difference BTW B-2 and B-21 (and as it seems also PAK-DA) is that first one got 4 engines (being so of the same category of Tu-160 or almost B-1) while the second just two (so being of about the same category of Tu-22M), production and maintenance cost would be so smaller allowing for a more consistent buy. And the history of the B-1 in its two versions is one of the most clear example of this. They started in the sixties with AMSA program in order to obtain an high speed, long range bomber able to flight at low quote (something B-58 and XB-70 were not able to do) to better penetrate soviet SAM defences of the time. McNamara however discarded the project and planned to acquire instead 300 FB-111 i.e. a specific strategical strike version of its most beloved plane. Republican president Nixon however resumed the project that led to the B-1A version i.e. a Mach 2+ plane initially though to be able of reaching supersonic speed at low quote also, a performance that was however discarded in order to simplify production and lower costs. That's was because Democrats were strongly against project and cancelled it when Carter went in charge. Their main arguments against it were that B-52 launched ALCM had the same low quote flight pattern at a fraction of cost while introduction of look down/shoot down radars in soviet PVO and above all the news about a Super-Foxbat (i.e. the MiG-31) ready to be produced would have made it redundant. In the meantime however Carter started, fully in secret, the ATB program about a stealth plane that led in the end to the B-2. Main reason for this changes was the somewhat wrong assumption that the B-52/ALCM would soon became obsolete while the actual scenario following the soviet Afghanistan intervention dictated a wider range of possible conventional mission for the bombers fleet instead of an almost exclusively strategical strike one. Variable intake ramps of B-1A were so forfeited, strongly limiting its own max hi quote speed and incrementing instead low quote one of a way smaller amount, some initial RCS limitation measures were undertaken and just 100 of them were produced. The final result was something that had an insufficient speed to made any difference in every mission that required a dash run while in the same time was excessively complicated and costly for a purely conventional one and was not good either as an ALCM carrier when compared with a B-52. Semi-stealth measures also, although costly and performance limiting, were not enough for keeping pace with radar tech evolution. So SAC obsession about the necessity of having planes able to penetrate into enemy AD (also in order to justify their own fair share of the bill...), the necessity of industrial complex to sell their gimmicks coupled with the flip flops of partisan politics led to the introduction of three different planes (FB-111, B-1B and B-2) either unable to perform an impossible mission or too damn complicated of costly to cover the actual strategic need. It seems that only with the B-21 they have finally realized how the idea of a penetrating strategic bomber was utterly unfeasible and are finally going toward s stand off missile carrier one instead i.e. something their counterpart already realized even before the Tu-22M introduction.